A bond is essentially a loan that has been turned into a security, which can then be traded. A government or corporation borrows money from investors and issues bonds in return. The bond represents a commitment by the issuer to repay the amount back at some point in the future, usually with interest. A variety of entities issue bonds to raise money. The associated risk and return related to the bond depends on who is offering it. Government or Treasury bonds – issued by the U.S. Treasury to pay for operating the government and financing the national debt. The return on U.S. Treasury bonds is the lowest, but they also have the lowest in risk. U.S. Government Agency bonds – issued to fund governmental agency programs, such as farmer loans or student loan programs. The return is slightly higher than Treasuries and they still have a low risk. Municipal bonds – issued by individual states, cities or counties. These bonds help pay for municipal projects and improvements. Yield is on par with government bonds with varying risk. Corporate bonds – issued by companies that want to finance their business ventures. Both the return and risk of corporate bonds are higher than government or municipal bonds. Mortgage Backed bonds – issued by banks or mortgage companies to provide money to home buyers. These bonds usually provide a higher return than corporate bonds without much of an increase in risk. Coupon – the interest rate a bond’s issuer promises to pay to the bondholder until maturity, or other redemption event. It is expressed as an annual percentage of the bond’s face value. Maturity – the date on which the principal amount of a fixed-income security is scheduled to become due and payable, typically along with any final coupon payment. Price – there are two key price concepts: Market Price – The currently quoted bond price and Par Value –The stated value of a bond. Yield – the anticipated return on an investment, expressed as an annual percentage. Credit Risk – refers to the possibility that the issuing company or government entity will default and be unable to pay back investors’ principal or make interest payments. Duration – measures how sensitive a bond’s price is to changes in the level of market interest rates. Diversification – investing in different asset classes and in securities in order to reduce overall investment risk and to avoid potential damage to performance tied to a single security, industry or country. In general, bonds help to diversify your investment portfolio, preserve principal, offer the potential to generate income and can also have tax benefits. Bonds fall in between cash and stocks in the risk/return spectrum. They offer moderate risk and moderate returns. Bonds offer diversification because they tend to zig when the equity market zags. The value of U.S. government-issued bonds tend to move in the opposite direction of the stock market. Corporate bonds tend to move more in line with the general direction of the stock market and may offer less portfolio diversification. Investment-grade, quality bonds tend to be more predictable than stocks. However, investors should be aware that bonds do involve some risk including changes in interest rates, inflation risk and call risk. If you buy a new bond and keep it until maturity, changes in interest and yields aren’t an issue. But when you buy or sell an existing bond, the price that investors are willing to pay for the bond can change, based on the expected return. Another way to diversify your bond holdings is to stagger the maturity dates. Buying a mixture of long-term and short-term bonds, called laddering, helps to reduce your risk and makes changing interest rates less of a concern. Since only a portion of your bond holdings will be maturing at any given time, you will be able to adjust your portfolio to minimize ups and downs. There are three basic ways that bonds pay the interest and principal. Most bonds pay regular interest payments over the life of the bond and then pay the principal after the bond has reached a set maturity date. Callable bonds pay investors regular interest payments, but the issuer may elect to “call” the bond and repay the principal at any time. Zero coupon bonds do not make interest payments over the life of the bond, but trade at a discount to the face value returned at the time of maturity. The price that investors are willing to pay for bonds is impacted by current interest rates. When interest rates are higher, issuers of new bonds offer higher rates to keep pace with the market. When this happens, investors are less likely to purchase existing bonds, which offer a lower rate, unless the bond price is lowered. When interest rates are falling, this drives the price of existing bonds up, because they offer higher rates. Bond prices are stated in terms of percentage of face (or par) value. So, if the price of a $20,000 bond is 95, that means the bond can be purchased for $19,000 ($20,000 X .95). 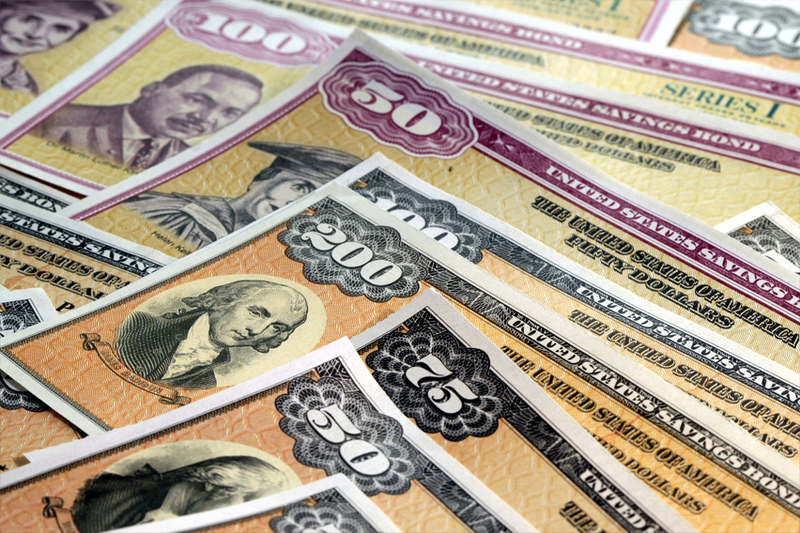 Unlike stocks, determining the exact price of a bond can be difficult. Bond pricing is derived by industry providers, so you won’t see a daily listing like those for stock prices. The derived price is calculated by factoring in the coupon rate, maturity, quality rating of the bond and other factors. When it comes to bonds, the general tax difference depends on whether you are investing in individual bonds or bond funds. This impacts how interest income is received and how capital gains are realized. If you hold individual bonds, you are taxed on the interest earned in the year it was received. For bond funds, interest income distributions are calculated regularly and distributed on a monthly basis. So, for bond funds, you are taxed in the year in which the interest accrues. For individual bonds, if they are purchased in the primary market at the original price and held to maturity, generally a capital gain or loss will not be recognized. If the bond is purchased in a secondary market at a premium or discount, this may trigger a capital gain or loss. It’s important to remember that your tax liability will vary depending on other considerations. Please consult with your tax professional for complete information.